With October and the 2015 AFSA Convention and Exhibition underway it can only mean one thing; the year is coming to a rather quick close. While Victaulic is excited to soon introduce a handful of new products to the fire protection marketplace over the course of the next few months, it is important to reflect on what sets Victaulic apart and how the company bridges the gap of innovation. We sat down with product director, Susan Schierwagen for an inside look at the depth of the Victaulic organization and what innovation means to her. Take a look! Susan, what is your current role and your background that lead you to Victaulic? I am the director of couplings, fittings and fire suppression products at Victaulic, responsible for the product management of those categories. I work closely with the technical team to bring new and innovative solutions to address the market needs. Prior to Victaulic I was primarily in a sales leadership role and that experience has served me well in terms of identifying market opportunities and understanding customer needs. Victaulic talks a lot about innovation, what does that mean to you? To me, innovation means providing a solution for an un-met need in the marketplace. So in essence you are able to provide groundbreaking technology that provides value to your customer, whether they are the installer, owner, AHJ, developer, etc. What types of research and development facilities/resources set Victaulic apart? We have a strong engineering and technical team that I believe sets us apart from in the industry. Not only do we have industry knowledge of the various markets but also in depth product and installation knowledge. Victaulic’s engineering services’ team that has depth in terms of product application. Our Construction Piping Services’ organization that has knowledge of the whole project’s life cycle, from drawings through commissioning; and strong knowledge of the software tools that are used in fire to design and/or coordinate construction on projects. Additionally, we have state-of-the-art testing facilities and labs, globally, that provide the appropriate facilities to test and support our innovation efforts. Describe your support team at Victaulic. My support team includes several product managers that are focused on various areas of our business. I have several strong technology teams that support the design of couplings, fire suppression products, alternative materials and tools. In product management, we have the benefit of a cross-functional team that allows us to look at the product in a holistic manner, from concept through to the launch and including support through installation and beyond. Describe the Quality Assurance Victaulic enforces. Victaulic holds itself to a high standard in terms of quality. We make sure all of our vendors are qualified from a quality perspective and all are reviewed for their process and procedures prior to us working with them. It is important to us to have quality assurance in the testing of our product all the way through to the qualification of our tools, materials and products. We continue to review that quality in order to maintain a high level of assurance throughout the life cycle of a product. We also have a dedicated quality team that coordinates very closely with the engineering, manufacturing and supply chain. What is your favorite part of the product commercialization process? My favorite part of the product commercialization process is the initial launch of the product. It is very rewarding for me to be able to go out and show a new technology or product solution to our customers and have them immediately endorse it. It is also very rewarding to see our innovation go into a project to solve a problem, meeting the needs of our customer, and then to be able to come back and share that success with the larger cross-functional team. After all, in the end, it’s the customer’s vote of confidence that counts. How will Victaulic’s product innovation move into 2016 and what are you most looking forward to as 2015 comes to a close? I am looking forward to several new exciting products that Victaulic will be launching in late 2015/early 2016. We are very close to introducing those new products and have a roadmap that will help guide us far into the future. 2016 will be a great year for product innovation and I know we are all looking forward to providing some game changing products for our customers. I can’t share too much now but be sure to stay tuned for what’s to come! 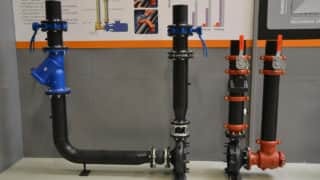 Victaulic is focused on pipe-joining solutions, the fire protection market and fire suppression systems and is currently showcasing some of those innovations at this year’s AFSA Convention. If you are attending and want to learn more be sure to stop by booth #501 to talk with one of Victaulic’s fire protection experts!